One of the most historic homes in Norfolk, Blickling Hall is a must see during your stay at the King William. Located in the pretty village of Blickling, under an hour’s drive from our front door, the hall boasts a spectacular library, a stunning façade and, of course, enchanting gardens. A National Trust property, Blickling is a fantastic day trip destination throughout the year. Why not plan a trip to this beautiful house and garden during your Norfolk getaway and experience one of the county’s most historic homes? Once the home of the infamous Boleyn family, Blickling Hall is the probable birthplace of Anne Boleyn, King Henry VIII’s ill-fated second wife. Though the house we see today was built in 1616 on the ruins of the older property, Anne Boleyn’s headless body is still said to wander its halls on the anniversary of her execution. Designed by Robert Lyminge, the architect of Hatfield House, Blickling Hall is one of the finest stately homes in Norfolk. Though no records survive describing their appearance, the gardens of Blickling Hall are known to have been in existence by the mid-15th century when the house was bought by the Boleyn family. In 1616, the gardens were landscaped to include ponds, wildernesses and an artificial hill to provide views of the local area. In the 18th century, John Hobart, the 2nd Earl of Buckingham, altered the gardens once more, removing many of the more formal elements and replacing them with a more naturally landscaped garden. After a huge programme of improvements and alterations in the early 20th century, the gardens now feature a mix of formal and informal areas. You’ll find large flowerbeds, beautiful sculptures, listed structures, wilderness areas and a wooded dell to explore, with a charming secret garden hidden in one of Blickling’s wildest areas. New features are being added to this beautiful space all the time, so even if you’ve visited the garden in the past, they’ll be plenty more to see. 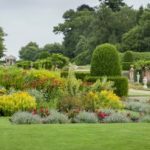 As opening times for Blickling Hall and garden vary throughout the year, it’s best to check the latest information before planning your trip. A café is available on site to keep you fuelled as you explore the area. 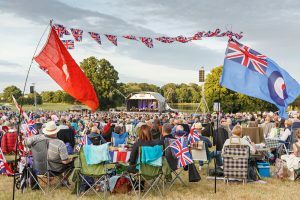 This entry was posted in What to do/Where to go and tagged Anne Boleyn, Blickling Hall, Brit Award, Day out, firework, Gardens, history, Holiday, Music, National Symphony Orchestra, national trust, Night of the proms, Norfolk on August 4, 2017 by Lili Skerritt. There are a few things that Norfolk has in abundance: stunning countryside, picturesque towns, great food and history. Having been inhabited since pre-Roman times, the county has seen Vikings, Anglo-Saxons, plagues, wars and natural disasters. On top of these dramatic happenings, Norfolk has also played an important part in Royal life over the years and castles, palaces and forts can still be seen across the county. As you can imagine unearthing and investigating this rich history is no easy task. Different periods of the county’s past are layered up in fields, residential areas and historic sites across Norfolk, giving archaeologists plenty to get their teeth into. From the 10th July to 12th August 2016 the exciting archaeological ‘Sedgeford dig’ is coming again to the field just behind us, giving all of our guests, the chance to see real history in action. SHARP, or the Sedgeford Historical and Archaeological Research Project, is a long term venture tasked with investigating and uncovering the “entire range of human settlement and land use in the Norfolk parish of Sedgeford”. This titanic task began back in 1996. This July and August the team will be excavating for their 21st season. There are various projects planned for summer 2016; from large-scale projects like excavating an Anglo-Saxon village to uncovering a medieval manor and identifying the exact location of a First World War aerodrome, the hard working team at SHARP do it all. If you’re interested in local history, there are lots of ways to get involved with SHARP’s upcoming projects. The team run a range of courses to teach people about archaeology, giving you the chance to gain first hand experience uncovering the treasures of Norfolk’s past. Schools and other groups who want to find out more about the work that the team do can arrange visits to the dig site. 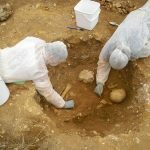 This gives pupils and enthusiasts a unique opportunity to look into Norfolk’s past and learn all about how the archaeologists interpret the objects and structures they discover. The site is open 10am-4pm each day except Saturday. Guided site tours are every Friday 3pm. A series of archaeologically themed lectures are given every Tuesday 7.30pm at St. Mary Church, Sedgeford, through the season. If you’d like to find out more about local history and the work that SHARP do, follow the team on Facebook or check their website http://www.sharp.org.uk for regular news and updates. 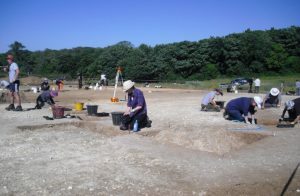 This entry was posted in What to do/Where to go and tagged archeology, dig, excavation, history, Norfolk, sedgeford, sharp on June 27, 2016 by Lili Skerritt.